I do love a bit of layering. It’s great to make heavily layered abstract soundscapes, filling the sound space. My work with John has taken me into the realms of pop too over the past year – making mainstream pop songs has been a new departure for me but learning how to do it has certainly helped with my understanding of mixing sounds. It’s been a real revelation how complex and layered mixes are, even when the finished track sounds quite clean and simple. 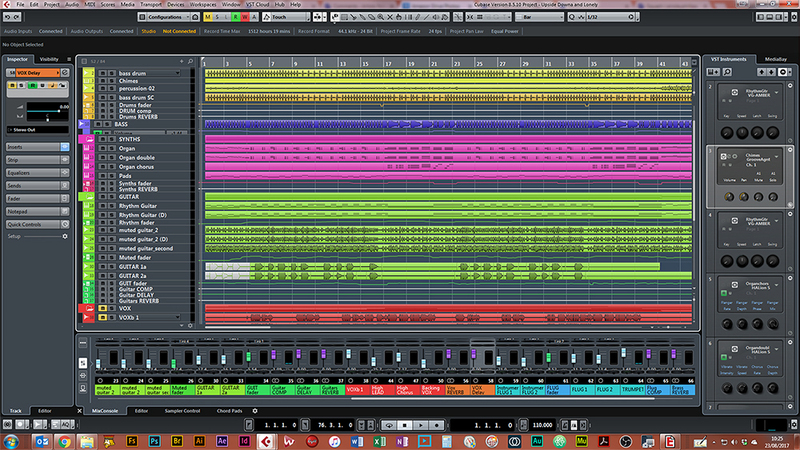 As a visual artist, I do appreciate my digital audio workstation, Cubase. I know you’re not meant to mix with your eyes (a serious sin actually) and I have learnt to spend much of my time mixing with my eyes closed, but the visuals do help me to be able to hold things together in my head, to keep a handle on the whole thing, and keep things tidy.